In 1993, Arlen D. Hanssen, MD, and David G. Lewallen, MD, noticed a phenomenon among total knee arthroplasty (TKA) patients who were being referred to them with “weird infections”: The patients didn’t have infections, they had flexion instability. Dr. Hanssen believes flexion instability is the number 1 cause of the so-called “unhappy knee.” But 25 years after he and Dr. Lewallen first identified flexion instability, and 20 years since they and their colleagues from Mayo Clinic first wrote about it,  he is amazed by how many surgeons either don’t understand flexion instability, deny that it’s a clinical issue, or don’t know how to evaluate and treat patients who clearly have symptoms of this pathology. Speaking at ICJR’s 7th Annual Revision Hip & Knee Course, Dr. Hanssen reviewed the presenting symptoms, physical examination, and stepwise surgical plan for correcting flexion instability. They had excellent early postoperative range of motion, but that’ because they had a loose flexion space from the beginning, Dr. Hanssen said. They have subtle symptoms of instability, such as difficulty going up and down the stairs and not trusting their knee on rough, uneven ground. They have peripatellar and pes bursitis symptoms. Evaluate anteroposterior stability at 90° with the patient sitting up, the affected leg dangling over the table, and the hamstrings relaxed. The surgeon grasps the leg under the knee and pulls forward on the calf to feel the AP translation. Perform a “knock” test, putting a hand under the patient’s thigh and rocking the leg back and forth. In a patient with flexion instability, the surgeon will feel the tibial plateau rocking on both condyles because the patient has an open flexion space. 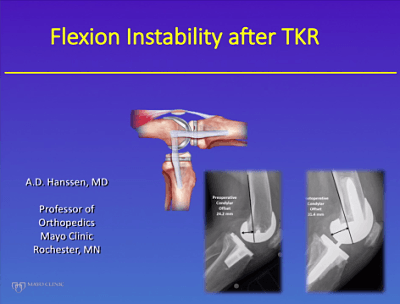 Click the image above to watch Dr. Hanssen’s presentation on flexion instability. Dr. Hanssen has disclosed that he receives royalties from Styker. Pagnano MW, Hanssen AD, Lewallen DG, Stuart MJ. Flexion instability after primary posterior cruciate retaining total knee arthroplasty. Clin Orthop Relat Res. 1998 Nov;(356):39-46. Abdel MP, Pulido L, Severson EP, Hanssen AD. Stepwise surgical correction of instability in flexion after total knee replacement. Bone Joint J. 2014 Dec;96-B(12):1644-8. doi: 10.1302/0301-620X.96B12.34821.